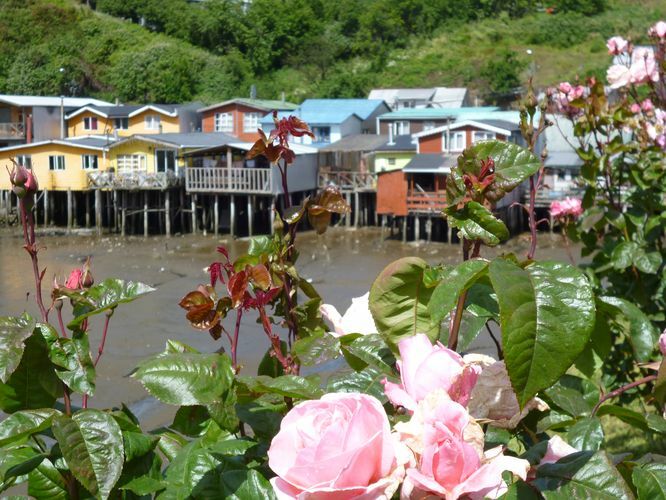 Puerto Varas nestled sweetly on the south shore of Llanquihue (yan key way) the largest lake in Chile is the adventure hub of the Chilean Lake District. On the far shore the snow-tipped Orsorno Volcano offers head-spinning vistas for hikers in the summer (November-March) and thrilling downhill runs for skiers in the winter. In the glacier moraine valley below lies is the gateway to Vincent Perez National Park where you can explore the Petrohue falls. Puerto Varas is also the headquarters for the Pumalin Park, a pristine wilderness area with native forests laced with cascading waterfalls. A fun day trip is a short ferry ride to the Island of Chilo’e that garners penguin sightings. Outdoor activities like, horseback riding, fly fishing, birding, trekking and wind surfing are popular pastimes for locals and tourists alike. The ride to Orsorno on a highway framed in brilliant yellow Scotch Broom spiked with magenta foxglove is breathtaking. 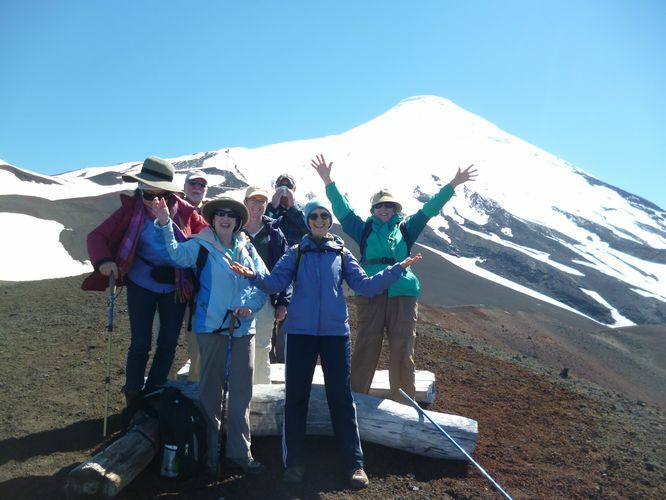 The road loops around sparkling Llanquihue with puffy white clouds floating in crystalline heavens and the snow-frosted peaks of the Andes glistening in the distance. Up you go on switchbacks snaking the flank of the volcano through stunted pines and flaming red fire-bush to the chair lift and ski hut. The path through the barren lunar landscape to stunning vistas is composed of slippery crumbled lava that requires focus and sure-footedness. The head spinning panorama takes in the width of Chile, a string been country flanked by the Andes on the east and the Pacific Ocean on the west. Dead ahead, the bad boy, Calbuco Volcano that blew its stack in 2015, looms on the horizon. This region is in the ring of fire with 2,000 volcanos, 43 of which are active. The threat of eruptions is real. Far below the silver strand of the Petrohue River spiraling through a verdant glacier moraine valley would be our next stop. At the very “touristic” Petrohue Falls we shared viewing spots with other visitors. The water charging over black lava boulders reminded me of the power of the water that continues to sculpt our planet. The minerals in the water coming down from glaciers high in the clefts of the mountains churns from aquamarine, to a foamy mix of turquoise, opal and moonstone. There are trails fanning out from the falls that take hikers to tranquil lagoons. Rafting trips are popular Further down river below the rapids. Continuing up the narrow track tracing the river we met Alex, a fisherman who ferried us over to his home on the river where we were treated to a lunch of local trout. There is a movement in Chile spearheaded by the late Douglas Tompkins and his wife Kristine, American philanthropists, who have battled for the last 25 years to preserve the wilds of Patagonia. 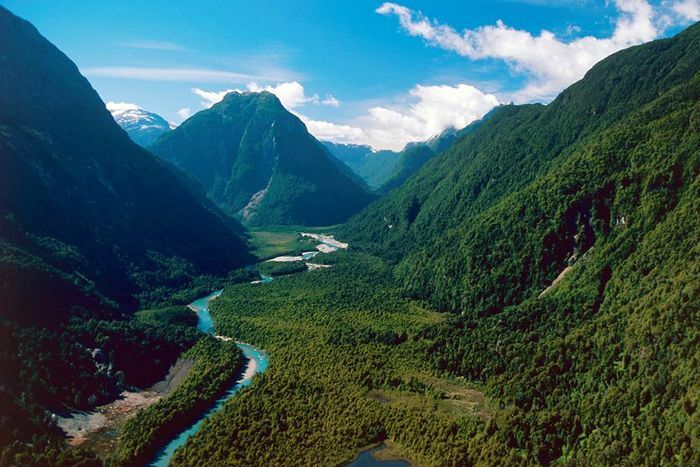 They donated 2-million acres of land to the Chilean and Argentinian government that includes Park Pumalin in the Chile Lake District. Their hope is that creating parks will bring people into nature and inspire them to protect and preserve the natural heritage of the gorgeous region. This act spurred the Chilean government to designate an additional 11-million acres of wilderness to what is slated to become the “Route of Parks.” The plan is to have campgrounds with facilities, well-maintained trails and scenic drives modeled after the National Park system in the United States. The information center in Puerto Varas provides brochures and maps for those who have time to explore what is one of the hottest destinations for outdoor adventurers. A 30-minute ferry ride landed us on Chilo’e, an island that evolved in isolation from the mainland. Our welcoming committee was a pair of black necked swans with a trio of cygnets trailing behind. In Castro, the largest city on the island, the San Francisco church is a UNESCO World Heritage site built entirely of wood and painted bright yellow to offset the gloom of rainy days. Carvings inside the church show how the mythology of the island’s people was integrated into the teachings of the Jesuits. We sauntered down to the shore lined with colorfully painted pole houses. The tide was out so the table was set for many shore birds picking for morsels in the mud. The chilote’s are sea people. The most important character in their mythology is the Siren. If she faces the sea it will be a good fishing day and if she turns away the fishermen will return empty handed. After a lunch of delicious seafood soup with all manner of shellfish laced with seaweed we were off to see the penguins. Our driver careened through lush emerald pasturelands to the Punihuil Wildlife Sanctuary on the Pacific side of the island where Magellanic and Humboldt penguins, sea otters, sea lions, and sea birds reside. We boarded a skiff and circled the sea stacks where hundreds of the flightless birds breed and find shelter from predators like sea lions who attack the chicks and gulls who steal their eggs. 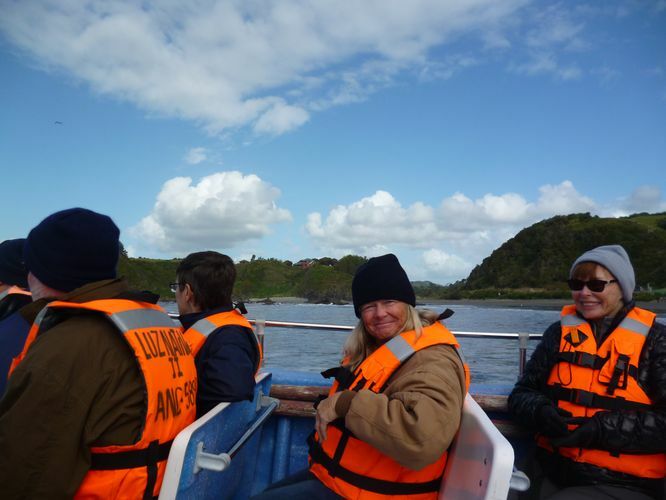 Chiloe’s catch-phrase is “No rain – No rainbow.” We were blessed with both on this spectacular day of bird watching. Back in Puerto Varas, a stroll along the lake front is a nice way to end a full day. Sailboats ply the azure water as lovers stroll by hand and hand and the sun casts a pink glow that blooms into deep purple. It’s an easy walk from there over to my favorite café hidden inside a rose garden where I enjoyed King Carb in avocado salad with oyster and salmon ceviche for starters. 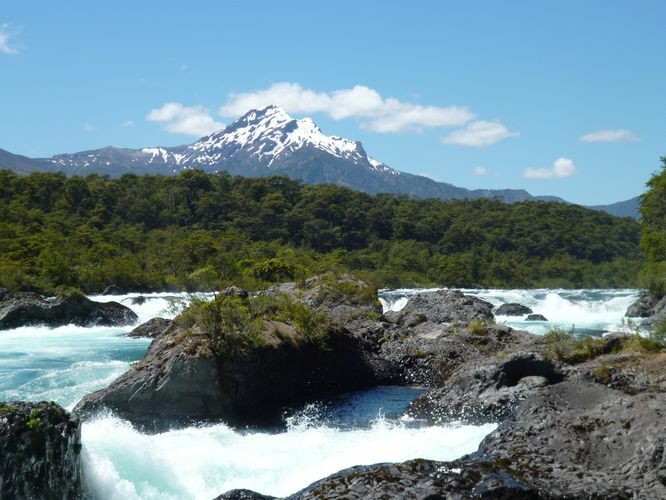 Thank you to Overseas Adventure Travel for including Puerto Varas in my Andes to Patagonia itinerary.